Growing up, Alton DuLaney received many beautifully-wrapped presents. “My dad was a great gift wrapper,” he tells Mental Floss. “He always made the holidays and birthdays really special.” Those wraps clearly stuck with DuLaney, who grew up to become creative director at Kate’s Paperie and, in 2008, took home the top prize in the Scotch Most Gifted Wrapper Contest (he wrapped, among other things, a baby grand piano). “Create your workspace before you create,” DuLaney advises. Because he prefers to stand, he makes a sturdy, waist-high table or countertop his base. Whatever you choose to work on, make sure the surface is clean. Ditto your hands: “You don’t want to get lotion or anything that might be on your hands onto the beautiful paper or ribbon,” DuLaney says. 2. … AND HAVE THE RIGHT TOOLS ON HAND. No workspace is complete without the proper tools. DuLaney always has a ruler and two pairs of scissors—one for paper and one for ribbon. “Sometimes your paper will have glitter or other things on it that will dull your scissors,” he says. “When you cut your ribbon, you want to have a very super-sharp pair of scissors to get a nice, clean cut.” To tell the difference, he ties a tiny bit of ribbon around the handle of the ribbon scissors. DuLaney also has two kinds of Scotch tape at the ready: Double-sided for complicated areas, and gift wrap tape with a matte finish “so even when it’s on the outside of the paper, it virtually disappears—you don’t see it.” He also keeps embellishments on hand to decorate the outside of the gift (more on that in a bit). “I like to gather all of those things before I start, and that way, once the creative juices are flowing, you don’t have to stop and say, ‘Where are my scissors? Where’s my tape?’” he says. 3. USE A MEDIUM GRADE PAPER. If your paper is too thin, it will tear easily, allowing package corners to poke through; too-thick paper, on the other hand, leads to a bulky wrap. DuLaney prefers a medium-grade paper with a bit of a metallic finish, which creates nice, sharp creases. 4. CONSIDER DOING A PRACTICE RUN. “This is going to sound crazy, but I always tell people to practice,” DuLaney says. “At the end of the season, I’ll go buy gift wrap on sale, and [next year], I’ll practice my wrapping before I start wrapping.” DuLaney advises practicing with ribbon, too. If he has a special paper—something hand-painted or hand-stamped—DuLaney will do a dry run with regular paper to see how it will work. “Then I’ll unwrap [the gift] and use that paper as a pattern, just like if you were working with a piece of fabric—you would use a paper pattern to make your fabric pattern,” he says. 5. CAREFULLY MEASURE YOUR PAPER. To get the most use from your roll, wrap packages with the longest side of the box facing the cut edge of the paper whenever possible. Then, before making your cut, pull the paper up over the sides of the box to measure: You want just enough paper on either side so they slightly overlap in the middle—meaning, each side will be a smidge longer than half the width of your box. “If [the package is] big, I’ll actually break out a ruler, to make sure I have more than half,” DuLaney says. He always errs on the side of too much paper—you can always trim later. 6. PLACE YOUR PACKAGE TOP DOWN—AND NEVER PUT TAPE ON IT. When it’s finally time to wrap your gift, place it top down on the paper. Next, pull one edge of the paper just beyond the edge of your gift; fold it to hide the cut edge—the white part, which DuLaney calls “the meat” of the paper. Most people would tape that to the package, but DuLaney advises against that. “When you take that paper off, you want both the ribbon and the paper to just fall away and reveal what’s inside it,” he says. Instead, grab the other side of the paper and pull it under the side with the folded edge. Align the folded edge with the end of the package and tape. Next, rotate the box to one of the open sides and fold the short sides down to create long flaps; repeat on the other side. “This keeps the package from sliding around inside the paper,” DuLaney says. Fold the flap closest to you downward; then, fold the one closest to your work surface toward you and tape. 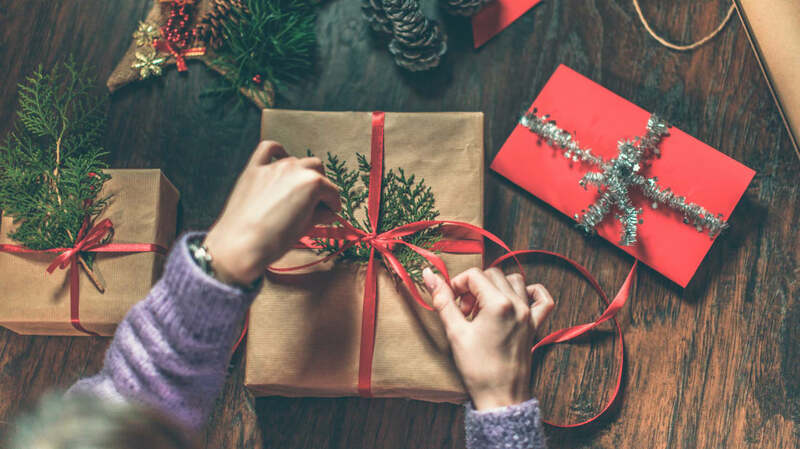 That way, “when you turn the gift over, and place the bow on top, the side flaps are going down, so you don’t see into the workings of the gift wrap.” Finally, using your finger and your thumb, crease the edges of your wrapped package. You can watch DuLaney walk Jimmy Kimmel through the process here. 7. IF YOU RUN OUT OF PAPER, MAKE IT LOOK LIKE YOU MEANT TO DO IT. If you mess up and don’t cut enough paper (or are at the end of your roll), it’s no big deal. There are solutions that make it look like that was part of your plan all along—like creating a belly band. “I cut a strip of paper, fold under each edge, and sometimes, I’ll pleat that into a tuxedo fold in the middle, and I’ll tape that to the other paper,” DuLaney says. When he does this, he wraps the gift top-side up. “I’ll have the gift right-side up and will construct the paper on top of the gift, so the belly band becomes the centerpiece.” Have a slice of exposed package on the ends? Use a wide ribbon or embellishments to disguise it. 8. WHEN WRAPPING CYLINDERS, PLEATING IS KEY. There are two ways of dealing with a cylinder: What DuLaney calls the bon-bon method—“where you scrunch the paper on each end and tape the ribbon on it” so it looks like a candy—and pleating. Trust us when we say pleating is easier to do than it is to explain—check out this video for a tutorial. Wrapping boxes is easy, but what happens if what you need to wrap isn’t box-shaped? DuLaney has several methods for dealing with this. The first—and easiest—is to grab a gift bag. “When I do a gift bag, I gift wrap my gift bag,” he says. “I’ll add a ribbon or a bow around the handle, or I’ll replace the handle with a matching ribbon.” Other times, he might wrap something tangentially related to a gift to place under the tree before revealing the real deal. “If I’m giving someone a tennis racket, I’ll wrap a tennis ball, and when they open that, I’ll present them the racket with a bow on it,” he says. Of course, you could buy a box to put your unusually-shaped gift in, but what’s the fun in that? 12. … BUT DON’T THINK CURLING RIBBON IS YOUR ONLY OPTION. 13. DON’T CUT YOUR RIBBON OFF THE ROLL UNTIL YOUR BOW IS DONE.